Hoya sipitangensis Kloppenb. et Wiberg (syn. Hoya walliniana Kloppenb. & Nyhuus; syn. Hoya yapianum Kloppenb.). This is a species that I have grown since prior to 1978. I got it from Loyce Andrews labeled “F-484.” * That is what I always called it. I never thought to compare it to any of Kloppenburg’s publications until recently. When he published this as Hoya walliniana, I finally took notice because I’d had some correspondence with the Wallin’s and had even been given one of their hoyas, by them. I had, about the same time, gotten a hoya from David Liddle, as IML-232. I wrote to David and told him, “Your 232 is Hoya walliniana.” At first he didn’t believe me but he later, listed it as that in his catalog. It was only after the one I had bought as Hoya sipitangensis (IML1603) bloomed, that I noticed that both these hoyas came from the same location, which is Sipitang, Sarawak. I got both publications out and compared them. At first, after looking at DK’s foliage picture, I thought, “No, the leaves are different but then, I went out to the greenhouse for another look and I saw that my plant had leaves that matched those in David’s picture (above) and also leaves that match those in the Kloppenburg picture. Then, I was, after much searching , sent a copy of the Hoya yapianum publication in the Gardens’ Bulletin Singapore 61(2): 327-333, by a friend who lives in Singapore. I immediately recognized it as Hoya walliniana but it took me several more months to connect all three of these. It is my opinion that they are the same. If I am mistaken, it is because I was sent mislabeled cuttings. I don’t believe that is the case. Another picture that shows how confused the authors of Hoya sipitangensis were is on page 5 of Fraterna 15, #3. 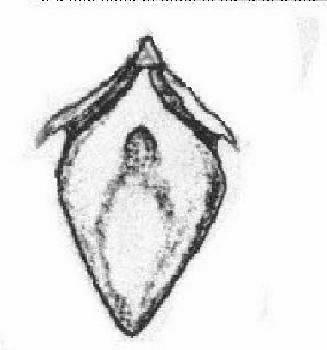 There is a picture labeled, “Outside view of the calyx, enlarged about 8X.” What is shown is obviously (to me) a corolla, not a calyx. I happen to know that there are people who’ve read that and looked at the picture and did not know what was pictured was not a calyx. I know because at least two people told me so. Those two were students in a summer horticulture class I teach at a local church’s vacation Bible School. I always introduce the kids to Hoyas and throw in a little “botany for gardeners.” Seasoned growers, of course, know that a hoya calyx does not have a hole in the middle of it, as the subject of that Kloppenburg picture, labeled “Outside view of the calyx,” does. So, I asked myself, what makes Kloppenburg think this is three species? I studied his descriptions and it appears to me that his separating this into all these species was based only on comparing the measurements of the flower parts of a couple or three different flowers. I challenge anyone to measure all the flowers in a single umbel of any hoya species. I am 100% sure you’ll find that most of the flowers will have slightly different measurements. That’s because, all the flowers do not open at the same time, even though they may appear to us to do so. Some umbels will have mostly fully opened flowers but often there will be several buds that haven’t begun to open. I’ve seen some take a couple days longer to open. Pictures taken for me by a friend, several years ago, with a camera attached to a timer which clicked on the shutter at timed intervals, 24 times during the night, gave us proof that all hoya flowers do not open at the same time, even though they appear to us to do so. We go to bed at night leaving an umbel of buds. Next morning, we awaken and see lots of flowers and jump to the conclusion that they all opened at the same time. Flower and flower parts measurements in hoya descriptions should not be taken as “critical” (a phrase often found in Kloppenburg publications). They are only approximates. Anyone expecting a flower or any of its parts to measure exactly what the author cites in his or her publication, will likely be disappointed. So what is the use of citing measurements? Well, let me cite a case where knowing the approximate flower size would have saved a lot of mislabeling. 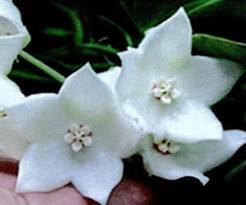 Back in the 1970s when Loyce Andrews was the only hoya seller with a really large inventory, she sold Hoya australis mislabeled as Hoya coronaria. When I wrote to her and told her that I was sure that label was wrong, she sent me a picture of Hoya coronaria. It was the one illustrating Henry Ridley’s Flora of the Malay Peninsula. She only copied the actual umbel of flowers in that illustration and none of the text. I could see how one might think that line drawing a match for the Hoya australis she sold to me, mislabeled as Hoya coronaria. I wasn’t fooled though, because I already had a copy of the entire illustration and a copy of Ridley’s text which described the flowers of Hoya coronaria as measuring more than 1½ inches in diameter. Knowing that the flowers on the plant I had were only ½ to ¾ inch in diameter, was useful in helping me determine that my plant was NOT Hoya coronaria. I got that plant from Loyce so I knew hers wasn’t Hoya coronaria either. Citing measurements in name publications is very useful, but we all need to know that exact, down to the last fraction of a mm. is not critical and not attainable because the flowers are like people. Not all of a single species measure exactly the same. Speaking of mislabeled plants, I was re-reading some of the many letters I received from the late, David Liddle, dated 22nd Sept. 1983. In the last paragraph of that letter, he said, “Every time one of our unflowered Hoyas decides to flower, it’s like putting money on a racehorse. It is a fair bet the name on the tag, if it has a name, is wrong!” It does seem that way sometimes but it isn’t as bad nowadays as it was ‘way back when! You may have seen Hoya pusilla listed in various catalogs (including the Liddle’s) as sp. F-484. This is not correct. Hoya pusilla is very similar in appearance to sp. F-484, so much so that when I first saw it, I labeled it “F-484-AB” and sold, swapped and gave it away so labeled. Those who got it from me, dropped the “-AB” off the end and called it “F-484.” The most significant difference is in the pollinaria, which have extremely short and fat pollinia. Those of F-484 are nearly twice longer and very slender. The plants pictured by this seller are just about the healthiest looking plants I’ve ever seen pictured on eBay and they appear, as a rule, quite large. The seller, however, appears to have labeled his plants sometime in the 1960s, using the labels that were on them when he got them, from (most likely) Loyce Andrews or one of us who got them from her. Her main sources (or so she told me) were a grower in France and Ted Green. A lot has been learned since then and this seller hasn’t kept up. Unknown Hoya listed as Hoya scortechinii. Neither foliage nor flowers are at all like Hoya scortechinii. Unknown Hoya listed as Hoya walliniana. I am very familiar with this hoya as I grew it for at least 30 years before it was finally given a name, however, I have just learned that the name Hoya walliniana is just a synonym for Hoya sipitangensis. See the picture, above. The plant pictured as it by “Fat Plant 2020” is not at all like it. Hoya shepherdii listed as Hoya longifolia. It has been at least 40 years since proof of this error was published in Chris Burton’s The Clay Pot and sent to all of her customers all over the US and Europe. The Clay Pot had a name change to The Hoyan when it was discovered that another, older house plant publication had the name, The Clay Pot. Proof that Hoya shepherdii and Hoya longifolia are two separate species was again published in The Hoyan. Fat Plant and Ted Green still cling to the mistaken idea that Hoya shepherdii is Hoya longifolia. Dear Hoya friends, just a cursory look at the two species’ coronas is enough to show them to be two different species. Left: Hoya longifolia Wall. – Right: Hoya shepherdii Short ex Hook. Photographer unknown – I’m sure I once knew. The most notable differences in these two species are, of course, flower size and colour. The more defining differences can be found in the different pollinaria and coronas. The corona lobes on Hoya longifolia are more or less flat on top, while those of Hoya shepherdii stand up at their outer ends. I haven’t yet had blooms on IML-185, which I got labeled Hoya longifolia so I can’t be 100% sure of its true identity. The foliage looks exactly like two things I bought from Loyce Andrews around 1978 as LWG-1 and LWG-2. She said that they were cultivars from Longwood Gardens’ hybridizing program. I knew the curator of Longwood Gardens, Everitt Miller, having met him at a Garden Writers of America convention around 1980. He was also a friend of my friend, Drayton Hastie of Charleston, SC, owner of the world famous Magnolia Gardens and Magnolia Plantation. Those two gentlemen invited me to join them and a few of their friends at a number of extra excursions not part of our convention which gave me an opportunity to question Everitt Miller about the LWG-cultivars. He told me that Longwood Gardens was strictly an exhibition garden; that it did not have and never had a hybridizing program of any kind. The only hoyas they had ever exhibited (as of that date – around 1978-79) were those sent to them by USDA that were listed in the USDA’s Plant Inventory # 178 (1972). I have no idea where Loyce’s LWG-1 and LWG-2 originated. I grew both for about 20 years and never saw a single bloom. I once knew lots of H.S.I. members who also grew them. Only one claimed to have gotten blooms but she never shared a picture of it. She just said that the flowers were pink. If anyone has bloomed IML-185 or one of those LWG mystery things, I beg you, PLEASE, send a picture and a note giving me permission to use it here. Hoya vanuatuensis listed as Hoya diptera. This is the one that was first distributed by the “extremely honest seller” featured in the last issue of PS-TheHoyan as Hoya chlorantha. When I wrote to him and sent him an illustrated copy of the original Hoya chlorantha publication, he wrote back and said, “I caught that too but I had to call it something.” I still have that letter. He then started calling it Hoya diptera. He was constantly told that it wasn’t that either but it took him twenty plus years to correct that mislabeling. And, just think, “Wannabe Hoya Authority” has told us we should buy from this “Extremely Honest” seller. Would an “extremely honest” person deliberately mislabel a plant because he “had to call it something”? People who don’t continue to get and study copies of all dealer catalogs (and most people don’t) don’t know when new things are learned about the plants they own. 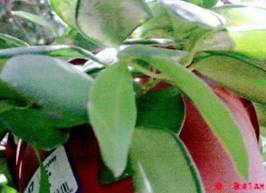 Those who bought a “Hoya chlorantha” from “extremely honest seller” in 1978 (or their heirs) could very well be selling or gifting others with a Hoya vanuatuensis mislabeled as Hoya chlorantha. Those who bought it from the same source in any year from about 1984 through about 2002 will pass it on as Hoya diptera. WHAT IS IML-380? IT CERTAINLY IS NOT Hoya chuniana P. T. Li (syn. Hoya reticulata Schltr.). Above Left: This is a typical leaf of IML-380, which David Liddle sold to me in 2009 as “PNG-6, aff. Hoya chuniana.” It is, also, not the hoya I grew for many years as PNG-6. If it is PNG-6, then I was sold a mislabeled plant by Loyce Andrews, back around 1980. So, what’s new? She sold me a lot of mislabeled hoyas. Out of a list of over 200 names, she had 7 correctly identified Hoya species and one of that 7 was only partly correct. 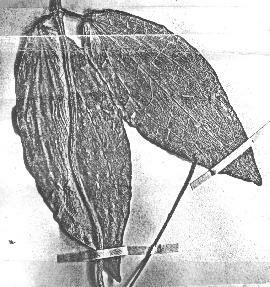 Above Right: These are typical leaves of Schlechter’s holotype specimen of Hoya reticulata Schltr., which is the specimen that P.T. Li named as holotype of his Hoya chunii. Hoya chunii is what is called an orthographic error. This type of error is automatically corrected. In this case it was corrected to Hoya chuniana because Chun was not the collector of the type. 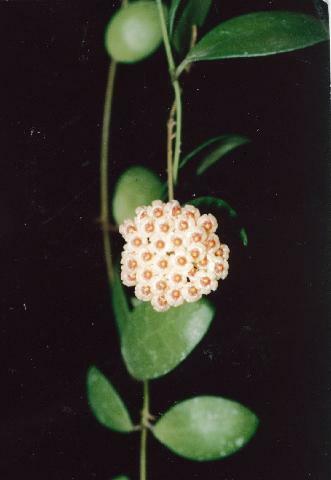 P. T. Li recognized that Schlechter’s name of Hoya reticulata was not tenable, due to three other species having been validly published with the same name prior to Schlechter’s publication. He republished it to honor one of his colleagues. 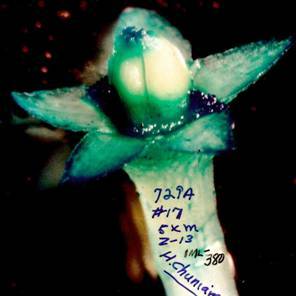 Remember this, Schlechter gave it the name “reticulata” because of the numerous reticulations that covered the leaves. While IML-380 has a few reticulations, here and there, on its leaf surface, in addition to the main leaf veins, one certainly would never call it numerously reticulated. 1). It is not the same species that I purchased from Loyce Andrews around 1980 as PNG-6. 2). Either David Liddle or I got a mislabeled cutting. It appears to me that just about every time a hoya or a hoya cutting passes from one person to another that the label on it gets changed to something else. 3). According to David Liddle’s last distributed Accession catalog, he got this hoya from “R. 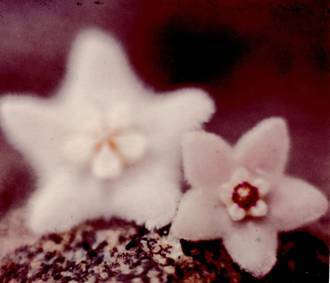 Robinson as Hoya cinnamomifolia.” So how did it come to be labeled by him “PNG-6” or Hoya aff. chuniana? It certainly doesn’t look at all like Schlechter’s (and hence, P. T. Li’s) type specimen. 4). It is also a known fact that some hoyas are close enough in kinship to be considered the same species if the flowers are alike but the leaves are different but, if such were the case, one would be a varietas or a subspecies. I don’t see these as being that closely related. I don’t know the source of R. Robinson’s plant or of Loyce Andrew’s plant. I suspect that Loyce got hers from Ted Green. I say that because she once told me she got most of her hoyas from him, however, I know she also got some from Jules Marnier Lapostolle (those F-numbers from France) and from a fellow named, I believe, Maurice Mason from England. She even bought and traded some with me. This points to another reason that everyone should keep the original labels on their plants and the names of their sources on said labels. Then, when we encounter two different species with the same label (or the same species with two different labels), we can trace the species to the source and, it is hoped, learn enough to identify it…… That’s a lot to hope for but it could be possible. 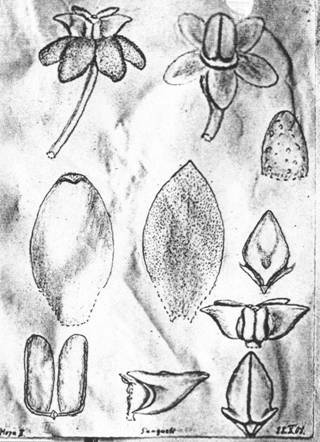 Schlechter’s sketches of the flower parts on the holotype specimen of Hoya reticulata Schltr., which became Hoya chuniana P. T. Li, due to a previous publication of a different hoya as Hoya reticulata. 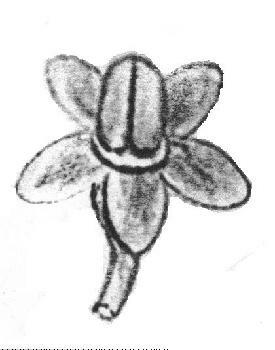 Left: Schlechter’s sketch of a Hoya chuniana (syn. Hoya reticulata Schltr.) calyx & carpels. 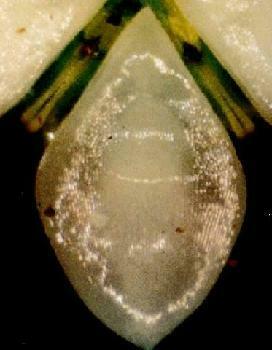 Note the broadly rounded tips of the sepals. Right: My photo of an IML-380 calyx and carpels. Note the acute tips of the sepals. Left: Schlechter’s corona lobe sketch. Note the broadest dimension near the top. Note also the pointed (almost acute) outer apex. Right: IML-380’s corona lobe. Note the broadest dimension near the middle and the obtuse (nearly rounded outer apex. Left: Schlechter’s sketch of the corona profile. Note the little pedestal (column) that the corona sits upon; the acute tips when viewed in profile and the slight downturn at the lobes’ tips. Right: IML-380’s corona profile. Note that it does not sit on a little pedestal (what looks like one at the bottom of the corona is a needle that I stuck into the center of the corona to make it stand erect for photographing). The flowers examined and compared here were furnished by David J. Liddle. Had he lived, we’d have hashed over this until we reached agreement as to what it was. Unfortunately, that is not going to happen now. So what is IML-380? Heck if I know. I hope the pictures presented here will inspire someone to compare them with all of the unidentified hoyas species they encounter and maybe someone will come up with an answer. Gardeners and plant collectors are among the funniest of those people Art Linkletter used to feature on his radio and TV show, “People Are Funny.” You youngsters won’t remember him. In fact, you may not have even been born when his programs were aired. The reason I say that Hoya collectors are funny is because I have witnessed a true happening. At an outdoor plant sale at a nearby town square, I set up two tables of Hoya plants. I had two of each species (one on each table). I labeled one of them correctly and I labeled one with a frivolous name (a name I have found the same species advertised as on eBay or in dealer catalogs, at one time or another). At the end of the day, I had sold every single one of the plants with the frivolous name and none of the correctly labeled ones, even though some of the correctly labeled ones were larger and healthier looking. I got the names and addresses of those I sold to. I contacted them later and corrected the labeling on their plants. 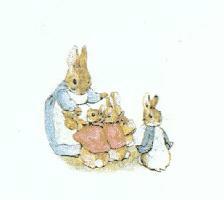 Above Right: Peter Cottontail & family. Note the tails on those Bunnies! The moral of this story is that Hoya buyers get mislabeled plants because that is what they have convinced sellers that they want. I got a very pleasant letter from the owner of this hoya seller. She said that she’d corrected a lot of names and had added a lot of new hoyas and asked my opinion. I gave it. The number of hoyas listed rose to around 223. This time I was able to enlarge the pictures which wouldn’t enlarge for me before so I got a closer look at all the plants listed. The lady pictured a hoya with large white flowers. The flowers appear to be almost flat or shallowly saucer shaped. She labeled it Hoya albiflora, a hoya with almost bell shaped flowers. Above left: SRQ’s phony Hoya albiflora, which I believe is Hoya magnifica. I’d need to examine actual flowers to be 100% sure. Above right: This is a portion of David Liddle and Dr. P. I. Forster’s illustration of the true Hoya albiflora. (greatly reduced in size). This picture is the same one pictured by Blume in his publication of the name. I’d have used Blume’s picture here but it is so large that by the time I reduced it enough to fit the space it would be impossible to see. Note the narrowness of the corolla lobes; the fact that the corolla is divided into lobes almost to the center of the flower and that the corollas are always bell shaped, not open as the corollas in the picture on the left. While there is red at the bases of Hoya albiflora coronas, the red is hidden. You’ll never likely see red there unless you dissect a flower. The lady pictured a hoya she called Hoya camphorifolia. She also pictured one she called Hoya fischeriana. It is my opinion that it shouldn’t take a 160 I. Q. and 20/20 vision for anyone to see that the two pictures are of the same identical species, yet she is offering them for sale to you as if they were two different species. She only showed flower pictures. Just reading the author’s name publications was enough to convince me that Hoyas camphorifolia and Hoya fischeriana are two different species. Left above: Hoya camphorifolia. Right above: IML-1289, which David Liddle determined to be Hoya fischeriana. Warburg’s type specimen was destroyed in WW-2 when Allied bombs fell on Vienna. 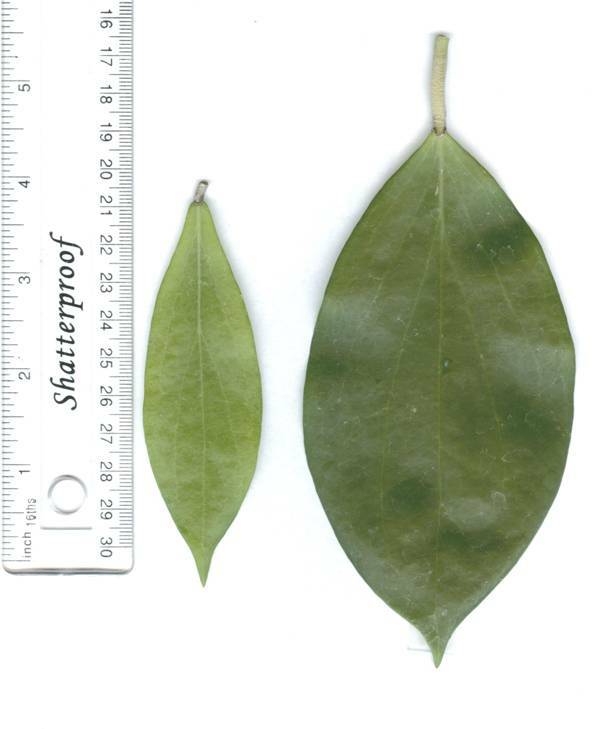 Other specimens determined by other authors to be Hoya fischeriana before those specimens were destroyed have leaves even larger than IML-1289. 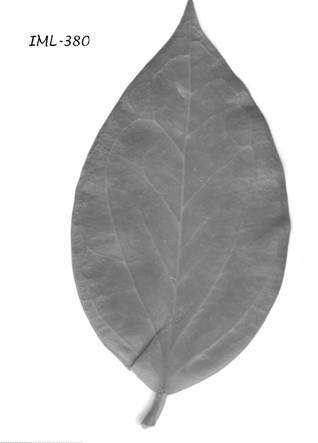 Warburg’s cited leaf measurements: 12 to 19 cm. long X 4 to 7 cm. wide. The lady pictured Hoya diptera as both Hoya diptera and Hoya vanuatuensis. Her pictures are the same but those two species aren’t. The lady pictured a leaf of what they are now calling Hoya meliflua subsp. fraterna as Hoya fraterna. I don’t recall seeing a true Hoya fraterna pictured in this catalog. The lady still has the label Hoya chlorantha on an imposter. The following is taken from correspondence. The author, in one of many letters suggested that I quote him (in The Hoyan) whenever his words would be helpful. Since this is more or less a continuation of The Hoyan, I’m sure he’d approve. The following is from a letter dated 22nd Sept. 1983. It refers to native Australian Eriostemmas. The lesson here, it seems to me is that one needs to see that the plants get plenty of water in autumn and little in winter and spring. If they are desiccated in spring, they probably were driest in winter. And, perhaps begin new growth in spring and mature in summer. One of the unfortunate things about these Eriostemmas seems to be their flowering period of June, July which is winter in Australia. This has prevented many growers to the South of Tropical Australia from flowering these species without the use of heated glasshouses as they seem very temperature sensitive. The Eriostemmas, in their natural environment, do suffer severe desiccation during the dry season months, and in some cases, defoliate. This would appear to limit their flowering period to the late wet season, about Autumn, as the plants would be too desiccated to flower in Spring. 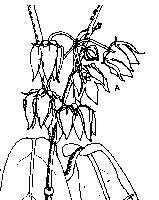 This theory would be in agreement with the flowering period under cultivation. Why is it that when the average US citizen makes an error and has it pointed out to him or her that he or she tells his or her critic that, “I’m praying for you?” If I recall my Sunday School lessons correctly, it seems to me that prayers were said for those in need, whether it be in need of food, clothing, shelter, healing or needed their errors corrected. Shouldn’t these people be praying for themselves, rather than those who corrected their errors? I have said, repeatedly, that I started the Hoya Society International (and its bulletin, The Hoyan) and PSTheHoyan as consumer advocate publications. If I see someone advertising a hoya plant with a wrong label and, if I know that the label is wrong, I believe I have a moral obligation to tell prospective buyers that if they buy that hoya plant that they will not be getting what they’re paying for! I didn’t think one needed to be prayed over for being honest and performing a needed service….. but then, again, maybe a few prayers by those who appreciate what I am doing, that those advertisers of things they don’t have, don’t come after me with shot guns would be appreciated. I don’t need prayers of forgiveness for telling the truth!